#24 | Where did my information from Sears Optical Go? Since the closing of Sears Optical in Kingsway Mall on December 15, 2017, some patients have been asking us where they can access their old eyeglass, contact lens, and patient file information. If you're looking for a copy of your patient file or your contact lens information that's a different story. All patient files and contact lens information are still the property of Dr. Kevin Tsen. To access a copy of this report, please visit the Alberta Association of Optometry website to get his new practice location(s). If however, you would like to have your patient file or contact lens information transferred to Stonewire Optometry in Kingsway Mall our front staff would be happy to assist you at the time of your appointment with us. You can book an eye exam with a Stonewire optometrist online, in-store or over the phone. #23 | Alberta Health Care Does Not Cover Eye Exam Fees for Adults ages 19-64. It's true. In Alberta, routine eye exams for adults between the ages of 19-64, are not covered or paid for by Alberta Health Care. Every week though someone tries to convince our staff otherwise. The most common misconception is when it comes to medically necessary testing in patients with conditions such as diabetes and hypertension that require annual dilated retinal exams. Yes, these medically necessary visits are covered under Alberta Health Care. But, medically necessary coverage only applies to the evaluation, treatment or monitoring of the eye condition and does not cover the cost of a complete eye exam for eyeglasses and contact lenses. So once again. In Alberta, medically necessary testing is covered, but routine eye exams for eyeglasses and contact lenses are not covered or paid for under Alberta Health Care for adults between the ages of 19-64, regular eye exam fees still apply for these services. You can go blind from diabetes. No seriously, you can. In fact, diabetes is the number one (#1) cause of vision loss in the working age population. Meaning, that it's not just an 'old' person problem as some patient would like to believe. There is also no 'good' type of diabetes; it doesn't matter if you have Type-1 (Insulin Dependent), Type-2 (Non-Insulin Dependent) or gestational diabetes, all versions of the condition can contribute towards the development of diabetic eye disease. As such, every patient with Type-1, Type-2, gestational diabetes or pre-diabetes should be seen every year by an optometrist for a dilated retinal examination. Why? Because early detection is still the best treatment we have. Bonus. Medically necessary visits such as diabetic retinal examinations are covered under Alberta Health Care when you visit your optometrist's office. You can learn more about the services we offer by visiting our eye exams | diabetic eye care page on our website. Remember you can use your Alberta Health Care card for prevention, not just acute treatment. This Eye Care Tip of the Week is brought to you by Stonewire. #21 | What's Your New Years Resolution for 2018? What's Your New Years Resolution for 2018? With another year coming to a close, it's important to take time to reflect on your life in 2017. The new year is also a convenient time to re-evaluate and refocus your personal goals. The one thing that 2017 reminded us of at Stonewire is that you can never take your health for granted. We call them game changer moments when one of our doctors has to deliver difficult news to a patient. Game changer moments not only affect our patients directly, but they shape how our doctors view and provide patient care. At the end of the day, everyone wants the same thing. To wake up healthy, happy, pain-free, and be able to do the things we want to do. As such, we ask that everyone make health care one of their new year's resolution for 2018. We wish everyone health and happiness in 2018, but wishing is sometimes not enough, so please book those appointments. Knowing your family history as it relates to eye disease or medical conditions can help to focus your optometrist's attention on areas of potential risk. Conditions such as glaucoma and age-related macular degeneration have been shown to have a high familial history link. Both of these eye conditions are also better managed when discovered in their early phases. 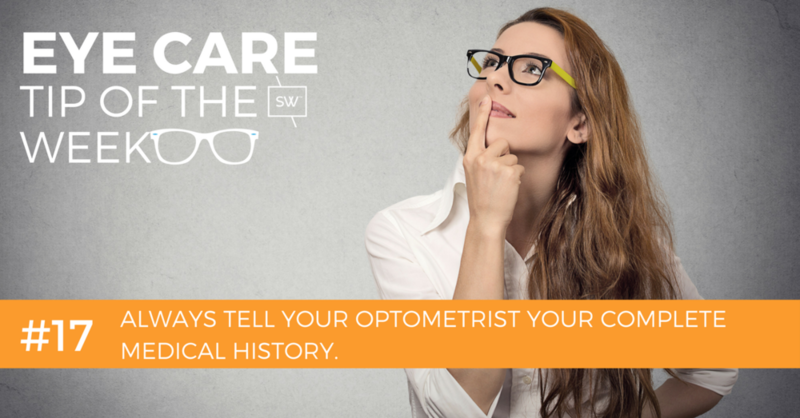 By knowing your familial history, your optometrist may screen for these eye conditions more aggressively by performing dilated retinal exams, visual field tests and OCT imaging of the nerves and macula. It's important to remember though, that just because you have a family history of an eye condition, it by no means guarantees that you will also develop it. Always talk to your optometrist about lifestyle improvements that you can make to help reduce your risks. This Eye Care Tip of the Week was brought to you by optometrist Dr. Jeff Holtz. Have you ever jumped out of bed and rubbed your eyes? Have you rubbed your eyes after getting something in them? Does allergy season just make you want to scratch your eyes out? Do you rub your eyes after a bright light gets shone in them, like when you visit the optometrist? In each one of these situations, you are probably doing more harm than good. Rubbing your eyes in the morning is your bodies way of trying to express the oil out of the meibomian glands in the eyelids and to stimulate tear production. A warm washcloth over your eyes works better. Rubbing your eye when you think you have something in them only moves the foreign object around on your eye causing more scratches and complications. Try flushing it out with a lubricating drop, or see your optometrist. Rubbing your eyes during allergy season just makes things worse. Rubbing the eyes causes a more significant release of histamines making the itch and allergies worse. Place a cold washcloth over the eyes or use a lubricating eye drop to flush out the histamines from the eye. Rubbing your eyes after having a bright light shone on them, won't make your vision return to normal any quicker. It can lead to an eye infection by transferring bacteria and virus' from your hands. Eye rubbing is a risk factor for developing a potential sight-threatening eye condition called keratoconus. Forceful rubbing of the eyes can lead to retinal detachments in patients with high nearsightedness or myopia. Rubbing your eyes can change the pressure in your eyes, which is terrible if you have glaucoma. Rubbing your eyes can break the small blood vessels around your eyes, leading to dark circles under your eyelids. If you 'need' to rub your eyes. We recommend that you do it very gently and always wash your hands first. The best alternative is to use either a warm or cold compress. When in doubt, wash your hands. Many eye infections can be prevented by simply washing your hands before rubbing your eyes or inserting and removing your contact lenses. Regularly washing your hands helps to remove dirt, dead skin cells and to reduce the spread of germs to yourself and others. Your hands come into contact with bacteria and virus' all day long, and these transient strains need to be removed. Failure to wash your hands before inserting and removing your contact lenses or rubbing your eyes results in the transfer of bacteria to the contact lens and may lead to an eye infection. To get your hands extra clean, make sure that you wash them with soap and water (warm or cold - they're both equal) for at least 20-30 seconds. Always dry your hands afterwards with a clean towel. Wiping your hands on your shirt and pants does not count. Every day when you get home from school or work. Before holding a baby or after changing their diapers. When in doubt...rewash your hands. Always tell your optometrist your complete medical history. Patients may often provide auxiliary health care providers like optometrists with an edited version of their healthcare history. They may unintentionally omit details, or they may feel that it's irrelevant, or they don't think it has anything to do with eyes. The truth of the matter is though, your body is a complete system, everything is connected. Health conditions can manifest in various ways, and the medications used to treat them may have visual side effects. Your visual symptoms may merely be revealing a more significant underlying health care problem that may be overlooked if your complete medical history isn't known. Every day doctors are put to the test; They make the best diagnosis and treatment plan they can, based on the facts available at the time. Failure to provide all the information they might require, really only affects you. The cheapest place to buy your contact lenses is probably directly from your optometrist. If you buy your contact lenses online or from a big box retailer, you very well might be overpaying. Patients are led to believe that they are saving big when they purchase online or that warehouse clubs, but that's just great marketing. So how is it possible? The per box price is almost always identical to other retailers, but most contact lens manufacturers offer patients who purchase from their optometrist's exclusive mail-in rebates that can be as much as $180 for a 1-year supply of contact lenses. They either provide the rebate in the form of a prepaid credit card or prepaid gift card which can be put towards your next contact lens supply. That's only $10.00 per month for a high-quality contact lens. Trust me; you can't beat that price, we've shopped it around. *Prices are valid as of 9/18/2017 - Rebates and contact lens prices may change without notice, please talk to a Stonewire staff member for the latest prices. There are no no-rub contact lens solutions. If you wear a two-week or monthly disposable contact lens, you must rub the lens every night after removing it and before storing it in fresh solution. This little step only adds 5-10 seconds to the daily process, but it certainly can make a big difference in your ocular comfort and health. The rubbing action helps to break down the biofilm that develops on the surface of the contact lenses and prevents the contact lens solution from properly penetrating and disinfecting the lens. All contact lens handling routines were re-evaluated after a rash of fungal keratitis outbreaks in contact lens wearers between 2005-2006. It was later determined that the mere act of rubbing the contact lens surface helped to disinfect the lens better than no rub techniques. Check out this great article on Pub Med: Soft contact lens cleaning: rub or no-rub? Sunglasses are probably more important in the winter than they are in the summer. When most people think about sunglasses, they think about summer. But did you know that sunglasses are almost more critical in the winter? With the sun rising later and setting sooner and remaining lower in the horizon, most Edmontonians will find themselves having to drive into its glare at some point during the day. Fresh white snow also makes the perfect reflective surface to further magnify the suns intensity, which can lead to blinding glare and a hazardous driving situation. So what should you look for in winter sunglasses? Polarized lenses help to not only reduce the suns intensity like regular sunglasses, but they also cut out the reflection from surfaces like snow, water and ice. By reducing the glare, you will be better set to see oncoming traffic, icy spots on the road, and most importantly pedestrians. We call brown tints, the happy hues! Unlike dark grey or black lenses that make the whole world darker, brown coloured lenses can actually improve contrast. They also tend to work better in a variety of lighting conditions, including overcast situations which we will encounter in the winter months. Brown coloured lenses block just as much harmful UV rays as grey or black lenses, so rest assured that your eyes are being protected. One of the single best things you can do to help manage or prevent dry eye symptoms is to apply a warm compress over your eyes every day. A straightforward and efficient technique for performing warm compresses is to use a washcloth that is heated with tolerably warm water from the sink and directly apply the cloth over your closed eyes for about 5 minutes. To achieve the best results, you should do this every morning and every evening. Warm compresses help to loosen the oil within the meibomian glands of your eyelids and improve their viscosity. This oil layer mixes with your tears and prevents them from evaporating, which allows them to stick around longer and hence relieves dry eye symptoms. To an eye doctor, warm compresses are the equivalent of brushing your teeth. Stop smoking cigarettes. No seriously, just stop. Most people know smoking cigarettes isn't good for them. Most people also know smoking cigarettes has been associated with an increased risk of developing heart disease, pulmonary or breathing problems and cancer. But most people are shocked to learn that smoking can contribute to blindness. If you smoke, you have an increased risk of developing certain eye conditions such as age-related macular degeneration, dry eye syndrome, cataracts, glaucoma and diabetic eye disease. There is never going to be a better time to quit smoking than right now. The sooner you quit the sooner your body can start to repair itself. If you need help quitting, talk to your family physician or visit the AlbertaQuits.ca website. Anti-reflective lenses are the single best upgrade you can make to a pair of eyeglasses. We recommend anti-reflective lenses to almost every patient we see because they allow for better light transmission. These lenses result in less surface glare, brighter images, better vision, enhanced cosmetic appeal and improved scratch resistance. Check out our blog post: Are Anti-Reflective lenses really worth the money? Some patients complain that anti-reflective lenses get dirty quicker, which is true, but if you follow last weeks tip of the week; Wash your eyeglasses like you wash your vehicle, you will love the improved vision they offer. Even companies like Apple now use anti-reflective coatings on their top of the line Retina Display computer and tablet screens. There is also anti-reflective picture frame glass which allows us to better appreciate art work from multiple viewing angles. So go ahead and upgrade your vision with anti-reflective lenses. If you need glasses to drive at night, it's fair to say that you should also be wearing them to drive during the day. Lot's of patients tell us that their vision isn't that bad and that they only need eyeglasses to drive or see at night-time. It's true; your eyesight will seem to get worse in low light situations because your pupil dilates and you start to manifest the symptoms of your prescription more. The opposite occurs during the day, where the light constricts your pupil and increases your focal range making your vision seem not that bad. But the truth of the matter is your prescription is the same in both situations. The bottom line is that if you see ok without eyeglasses, but you see perfect with them, you should probably be wearing them to drive. It's important to be truthful with yourself because driving can have serious consequences when things go wrong. In fact, driving with impaired vision is the same as drinking and driving and carries the same consequences. Just remember, glasses are cheaper than bumpers. This Eye Care Tip of the Week is brought to you by all the doctors and staff at Stonewire. Your eye is a muscle that can become strained and fatigued with chronic over use. Working on computer monitors, watch TV all day, reading books or doing paper work can lead to frontal headaches, eye strain, sore burning eyes, and general fatigue. It can also lead to something known as pseudo-myopia, where you become temporarily more nearsighted at the end of the day and notice increased blur when you drive home. Now you probably can't quit your job because you likely have a mortgage to pay. So what's the solution? Just follow the old 20/20/20 rule! Go ahead and give it a shot, we're sure you'll feel better at the end of the day. You might even feel up to working an extra hour or two for the boss. Most people don't clean their shiny new vehicles with a spray bottle and a rag, so why do we clean our eyeglasses that way? So forget the spray bottles, lens wipes and microfiber cleaning cloths given to you by the optical company. to remove the dust and debris from the lens surface. to the lenses and frame surface to remove the dirt and oils. to remove the soap residue and oils from the lens surface and frame. Dry your glasses off with a soft cotton cloth. For best results, use an oil free foaming hand soap for a clean streak free shine. Use a cotton cloth that doesn't have fabric softener on it to wipe your lenses to prevent greasy streaks. Don't over clean your glasses when your dry them. Excessive buffing can produce a static charge to the lens making it attract dust, dirt, and oils more quickly. Take it one step further. If they're still not perfect you can now use the lens spray and microfiber cleaning cloth to put the final touch to them. Just remember to wash the cleaning cloth every few weeks to remove the dust and dirt to prevent small surface scratches.